Ahaz is reminded that he represents the whole house of David. His attitude is consistent with that of all of Judah. Ahaz and Judah wearied men, surrounding nations were fed up with them, perhaps like many EU nations are fed up with Britain!? But worse than that, they wearied God as well. They needed to turn to God, and God was urging them to do so, and prepared to go to any lengths to get them to do so. That was why He urged Ahaz to seek a sign. So the Lord would give them a sign, whether they wanted one or not! There is great debate about whether the word translated here means virgin or not, and the debate occurs because of the virgin birth of Jesus. The Hebrew word translated virgin does normally refer to an unmarried woman who would be a virgin. However, in one sense the debate is utterly pointless and demonstrates a misunderstanding of prophecy. Many prophecies, especially messianic ones, have an immediate, or near-future, fulfilment, and a much later the fulfilment. The immediate fulfilment foreshadows the later one. So a son would be born. However, the use of virgin in relation to the immediate virgin just means the woman was not married yet. So there was no “virgin birth” in Isaiah’s day. When Jesus came there was a virgin birth (or more properly, perhaps, a virgin conception). Immanuel means “God with us”. Now let’s look at what is going on here. Ahaz, representing Judah, is refusing to live by faith, refusing to have much if anything to do with God. He is denying God’s existence or relevance. Even so, God will send a sign that He is indeed with them, whether they like it or not. The world as a whole denies God’s existence or relevance, especially in the West. We can be sure that at some point God will intervene, and demonstrate His existence and relevance! The woman knew it was her and she came to Jesus in fear and trembling. Given all her past she probably thought she was in trouble. The years of rejection had probably built her a deep fear and insecurity. Yet she knelt before Jesus and told Him everything. Jesus then tells her that her faith has made her well. Far from being condemned for touching Jesus or coming to Him, she is commended by Jesus. She is also told that her faith has made her well. She would not be used to being praised. It is also significant that Jesus calls her daughter, He is saying that she is a full member of God’s kingdom, God’s family, no longer someone who cannot partake of the worship of God. “Be healed”. Why does Jesus say this, she has just been healed? Jesus is just affirming that she is healed, what has happened is of God and it is good. Let us remember that while all this is going on Jairus is still waiting for his daughter to be healed, and the situation is getting more and more desperate. One can imagine how he is feeling. Then someone from his house came saying that his daughter is dead, and there was no point in bothering Jesus anymore. Easter Day 3 - He’s Alive! On this day the world of the disciples was turned upside down. The women went to the tomb in order to anoint Jesus’ body with spices, as was the custom. But when they went there they found that the heavy stone that sealed the tomb had been rolled away and the tomb was empty. They were met by an angel who told them that Jesus “is not here, He has risen!” (Mark 16:6). Then Peter and John went to the tomb, and they too found it was empty (John 20:1-10). At that point all they had was an empty tomb. Things were not what they expected, but they had not yet seen the risen Christ. Then there were various instances of Jesus appearing to groups of the disciples. To the women, to the disciples in locked rooms, to the two disciples on the road to Emmaus, to the disciples by the shore. Then Jesus ascended to heaven, promising to return. But He was not leaving us alone, He would send the Holy Spirit to dwell within us. Moreover, there was work to be done, the work of making Christ known to the world. There is a purpose to our lives, a purpose and meaning that is found only in Christ. Because of what happened on that cross two thousand years ago I am free to live, I am free to love. I am free to give because He gave all for me. One day I will die, but I know that day is not the end, but only the end of the beginning. I will live and reign with Him forever. And I can live now, not for myself, but for Him and for those whom He calls me to love. Sometimes this will involve a great cost, but if we share in His sufferings we will also share in His victory. His victory won through suffering. If you already know Jesus, then may He open your hearts and minds all the more to the victory of Easter. Maybe you don’t know Jesus yet. May be you only have an empty tomb. You know somethings up, but cannot understand what. May be it means nothing at all. If that is you, can I encourage you to ask God to make Himself real to you. Jesus is the hope of my life, the reason for my life, He is my everything. May He be your everything too. Mark 5:30-32 - Who touched my garments? The woman may have acted furtively, but Jesus knew that power had gone out of Him. Now this raises the interesting question of whether Jesus healed the woman because He is God, or as a man living in complete obedience to God. In favour of the latter view is the fact that Jesus at times gave His disciples the power to heal, and He expected and wanted people to believe that God would heal. So I would say that the clear Scriptural evidence is that some healings occurred because Jesus was a man perfectly under God’s authority. However, that does not necessarily mean that all healings were a result of this. The reference here to power going out of Jesus could mean that this is an instance of Jesus healing as God. Against this is that this seems to have happened without any conscious action on Jesus’ part, whereas in other healings it was a conscious act on His part. It could be that here the power of God flowed through Jesus. Whatever the case, the disciples thought Jesus was mad. How on earth could He expect to know who had touched Him when so many people were milling around Him? But Jesus wanted to know. The woman had been healed of her physical condition, but the condition had also had an effect on her as a person, living for twelve years in a state of disgrace, not able to fully join in the religious life of the community, being someone others would be wary of even touching, and being reminded of this daily. She could feel rejected by men and by God. This needed to be dealt with. 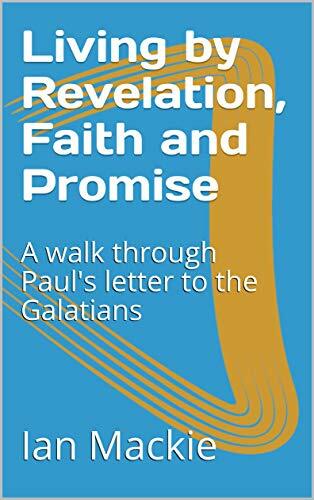 As an "Easter Special" my book, "Living by Revelation, Faith and Promise - A Walk Through Paul's Letter to the Galatians" is available at a reduced price on Amazon. 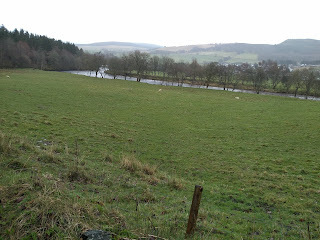 You may well have seen my notes on Galatians on my blog. Obviously the theology in the book is the same, the book is not a mere amalgamation of these notes. It is written as a book, with a clear theme. I am also working on a book on Ephesians, though it is likely to be towards the end of the year before that is ready. 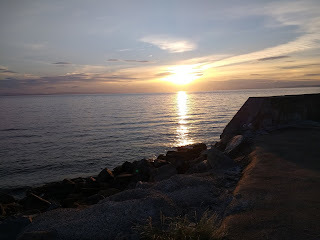 Thank you for reading my blog, I hope you find it helpful. The Saturday is a strange day in the Easter story. At the time nothing much happened, for it was the Sabbath. The previous day was literally an excruciating day, and then a day of numbness, of seeming nothingness. What had happened? It all seemed like the end, what had begun with such hope had ended in tragedy and disaster. And now the disciples, men and women, were left to pick up the pieces. On the cross Jesus exerted His kingly authority and defeated sin, death and the devil. He did this not despite the suffering, but through the suffering. He paid the price in full for my sin and sinfulness, and your sin and sinfulness. Some people object to this concept, I do not understand such people at all. My sin is so serious, something needed to be done about it. If Jesus has not paid the price for my sin, not taken upon Himself the punishment, the penalty, I deserve, then I am an enormous trouble. I am lost without hope. But He has paid it, so I am free! He defeated death. If I die before Jesus returns, then when He does return I will be raised from the dead, I will be given a new body, a resurrection body. I will reign with Him forever! He defeated the devil. The devil no longer has any hold over me. I do not mean any cheap, superficial victory. The devil still has teeth, still causes much suffering and trouble. But James 4:7 says “resist the devil and he will flee”. We may face much opposition, but if we stand firm it is the devil who will flee. In Eph 6:11 Paul urges us to “stand against the schemes of the devil”, and in Rev 12:11 it says of the devil “who leads the whole world astray”, that “They triumphed over him by the blood of the lamb and by the word of their testimony”. Jesus won this victory through the suffering, not despite the suffering. And we see this pattern repeated throughout history and the world. The kingdom of God grows when God’s people are prepared to pay a price. Today there are many Christians in the world who daily face persecution, but “they do not love their lives so much as to shrink from death” (Rev 12:11, end). They continue to love Jesus and to rejoice in Him. If we are at a Saturday stage in our lives, wondering what has happened, thinking it has all gone wrong, may we meditate upon the victory of the cross, achieved through suffering. Tomorrow the victory that has already been won will be realised, will burst into life. I first published this a couple if years ago, but it is always good to be reminded that the resurrection is not make-believe, but an event supported by much evidence. I have also added a wee bit to the original publication. This is just a very brief primer on the evidence for the resurrection. There are many sources on the internet, eg on Desiring God and books which go into things in much more detail, and it is important for us to know that while ultimately it is by faith that we know that Christ is risen, this belief is actually supported by the evidence. So here is a brief summary of the main points. The gospels themselves and the New Testament letters. The New Testament letters were out within a relatively short time-frame of the events of Easter. The evidence for the reliability of the New Testament documents is overwhelming when compared with other events of similar antiquity. The empty tomb. If Jesus had not risen, then the easiest thing for the religious or civic authorities to do would have been to simply point to the tomb where He was buried, but they could not do this because the only tomb they had was an empty one. The church. How would the church have got started and grown without the resurrection? Personal encounters with the risen Christ. If Christ was not risen, how is it millions of people, myself included, claim to know Christ? None of the arguments against the resurrection stand up to scrutiny. Here are several examples. If this was true then why didn't the authorities just point to the tomb where Jesus was buried? If they had made it up would they have been prepared to die for a lie? Surely the body would have been found at some point? And again, why would they do it, and why would they be prepared to die for their faith? There were multiple appearances to different people in different circumstances. This makes hallucinations a totally implausible explanation. And again there is the question, why didn’t the authorities point to the tomb? Jesus never actually died on the cross. Muslims believe something like this. Sometimes it is referred to as the “swoon theory” saying that Jesus merely swooned and was revived by the cool of the tomb. This is perhaps the most ridiculous suggestion. Jesus was severely beaten before the cross itself, He could not even carry His own cross. The Romans were experts at two things, building roads and killing people. Even if Jesus had not died, which is most implausible, what state would He have been in even if the “cool of the tomb” had revived Him? And how did the stone get moved? The gospel records clearly show that the disciples were not gullible, and had no expectation of Jesus being raised from the dead, even though Jesus told them He would be. The two disciples on the road to Emmaus had been told by the women and Peter that the tomb was empty, yet they still did not believe that Jesus was alive until He appeared to them. The very fact that women were the first witnesses to the resurrection is remarkable enough in itself. In the culture of the day if this had been a made-up story it is almost certain that they would have had men, presumably one or more of the apostles, as the first witnesses. But instead we find women as the first witnesses. In Mark 15:47 it states quite clearly that the women knew where the tomb was, and they knew that a stone had been rolled across it to seal the tomb (15:46; 16:3). So they knew exactly where they were going and what to expect. The long and the short of it is that it is perfectly reasonable to believe in the resurrection of Jesus. It is a unique and an amazing event, but it is also one whose veracity is supported by the evidence. My belief that Jesus rose from the dead has no problems with the evidence, whereas, those who deny the resurrection have enormous problems with the evidence. We can confidently rejoice in the resurrection of our Lord Jesus Christ! My name is Ian Mackie and I go to the Gate Church International in Dundee, Scotland. However, I must stress that anything I say in these notes is entirely my responsibility. By the way, do not be misled by the publication time of the postings. They are usually written several weeks in advance (currently over three months in advance), and set to be posted automatically at sometime in the early morning. While I am a morning person, I do not get up a 4am in the morning to write this stuff! You can find some complete sets of notes on various books here. Isaiah 6:11-13 - For how long, Lord? Mark 5:6-8 - What have you to do with me, Jesus? Mark 4:39-41 - Who is this man? Isaiah 6:6-8 - Whom shall I send? Mark 4:35-38 -Do you not care about us? Isaiah 6:4,5 - Woe to me, I am ruined! Isaiah 5:20 - Woe to those who call evil good! Mark 4:13-15 - Do you not understand?